Nothing starts your day off better than reading an inspirational message that gets you excited and get work done. 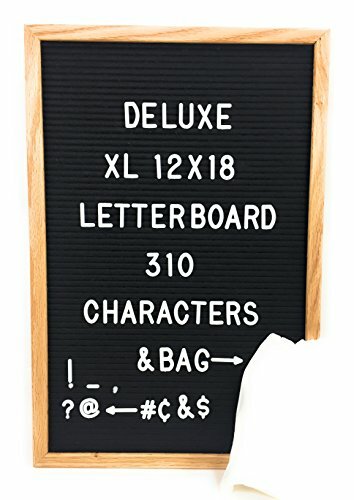 If you're looking to display inspiration for the day so everyone can see, this felt letter board is designed with that in mind. This letter board allows you to handcraft your words with care that provides a long lasting impression for the people around. This can be used for office, dorm rooms, schools and local shops to show that you have something special to share. We figured you want to use this letter board to remind everyone about the upcoming event next week or organize a plan for that special loved one, and we designed this with that in mind. Sharing events on social media is quick and easy - and quickly and easily forgotten too. With our exclusive felt letter board, you can create an impression that everyone will remember and see it all the time as they pass through the same path where the board is located. It's stylish, modern and adds a fashion statement to any home decor. Say it like you mean it. It's not what you say, but also how you say it. Scroll Up & Click The Add to Cart Button Now! ★ LOVE IT OR YOUR MONEY BACK - We know you have options here, and we want to make the best choice the easiest one. That's why we offer a 100% Satisfaction Guarantee. If for any reason our product doesn't exceed your high expectations, send it back to us for a replacement or a full refund. The choice will be yours! If you have any questions about this product by Shout Out! Letter Boards, contact us by completing and submitting the form below. If you are looking for a specif part number, please include it with your message.